The first modification I made to my Tensa 4 was “purposeful spliced” ridglines. One for each of the two hammocks I use with my stand. One for an 11ft GE, and the second for my Amok Draumr. This reduces the fiddle factor greatly. Specific ridgeline for specific hammock - great idea. Also have specific suspension and mark head and foot. We can't send them out that way - we would go nuts with all the possible variations. Second Orange Screw and head tether (specifically designed to allow some play) is now standard. I've had the chance to setup and takedown my v2 stand in my backyard 4(5?) times now. After the initial setup and configuration, the setup is very slick, and just takes a few minutes, maybe 5 minutes if I'm going slow. The takedown is only 2-3 minutes, again if I'm slow. The keyed grooves on the tubing are really, really great. This makes setup as simple as extending the tubes, with no fiddling around trying to match the holes to the pins. The anodized tubes are fantastic, and I'm sure will wear for significantly longer than I ever will. I'm really, really pleased with this stand! It's a great, quality piece of gear. As a bikecamper I'm committed to sleeping off the ground. My Amok Draumr XL on Tensa 4 stand. 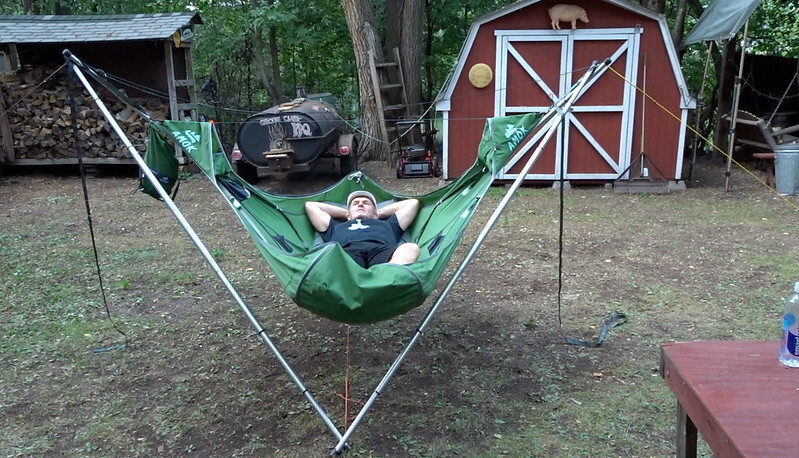 The tensa7 will hold two hammocks. Is that just adding three more sides to a tensa4 starting at the foot end?